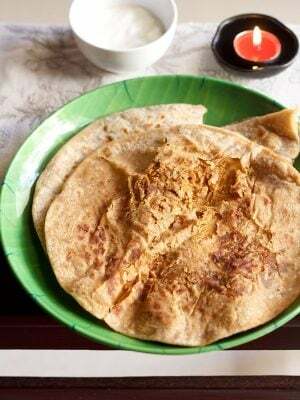 papdi chaat recipe with step by step photos – i still remember having papdi chaat for the first time in a punjabi restaurant in mumbai (can’t remember the restaurant’s name). 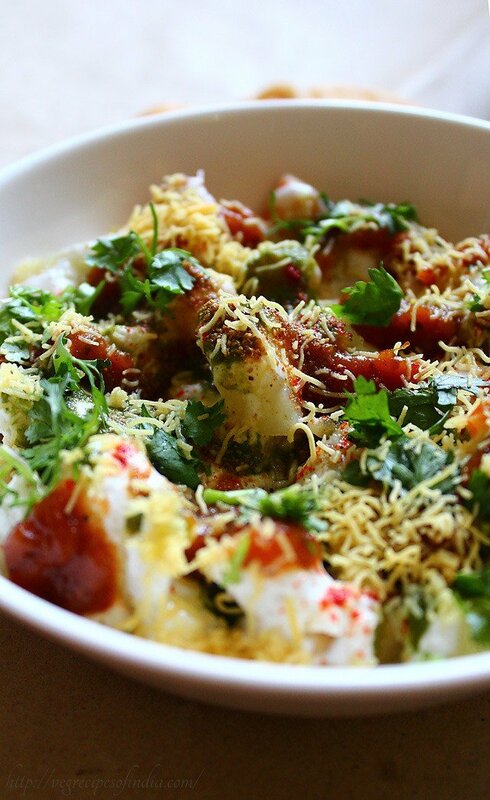 it was one of the best papdi chaat i had in mumbai. when living in delhi, i had papri chaats often, but cannot forget the one i had in mumbai. being a true blue mumbaite, i have always made sev puri, pani puri, bhel puri, dahi puri at home, but never papri chaat. 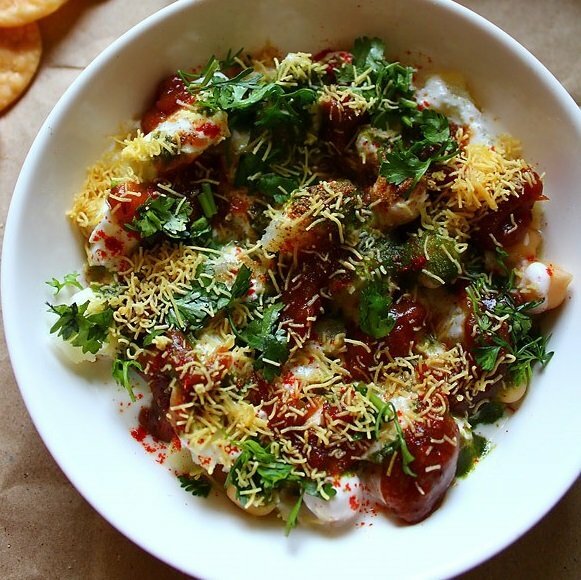 not that papdi chaat is difficult or time consuming. just that it did not come to me that i can make it at home. so for the first time i made papdi chaat at home and it was exactly like the one i had in the mumbai restaurant. i made it the same day when i made sev puri. 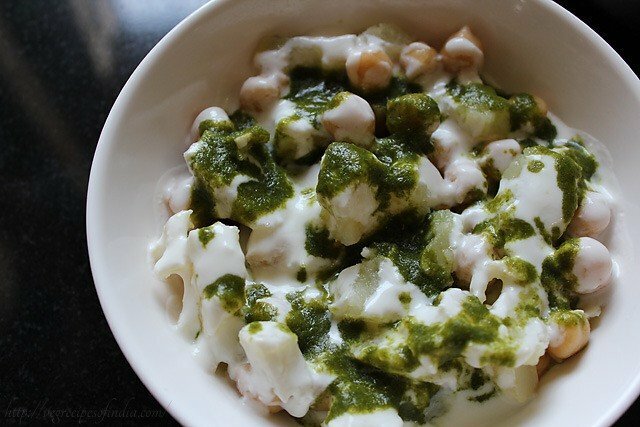 in papdi chaat, besides the papdi (fried flour crispies), a melt in the mouth fusion of boiled chickpeas, potatoes and pakoris (fried black gram fritters) and curd (yogurt) is added. 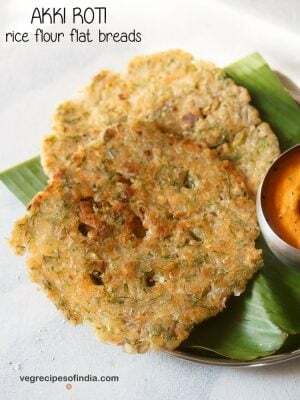 in this papdi chaat recipe i have used all the ingredients except the urad dal pakoris. 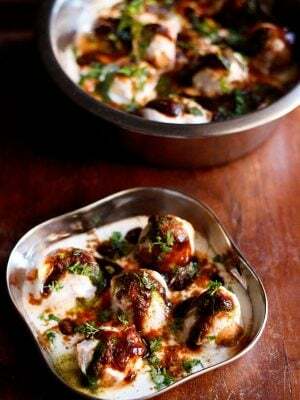 the pakoris are made exactly like the bhallas made for dahi bhalla. i did not have time to make the urad dal pakoris. 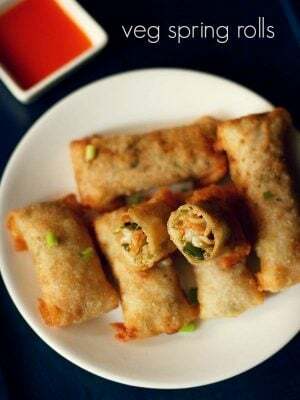 if you decide to make the pakoris, then after deep frying them, let them cool and then soak them in water for some time. squeeze the water from the pakoris and add it to the papdi chaat before you top it with the curd and the chutneys. 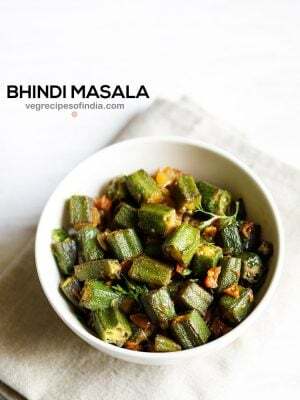 as a substitute for pakoris, you can also use boondi. soak the boondis in water and then squeeze the water from the boondis. add these to the papdi chaat. 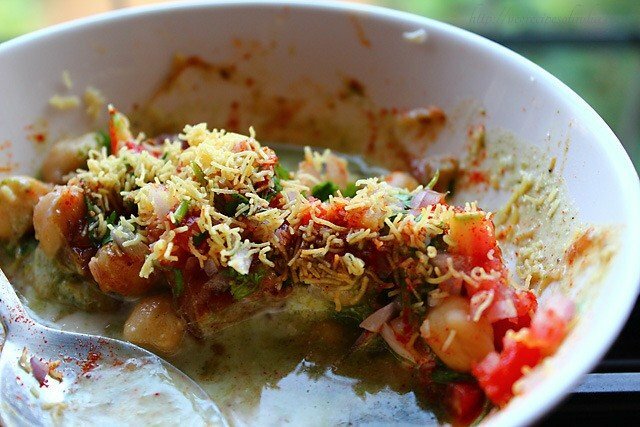 to make the papdi chaat healthy and nutritious, instead of fried papdis, use baked papdis. 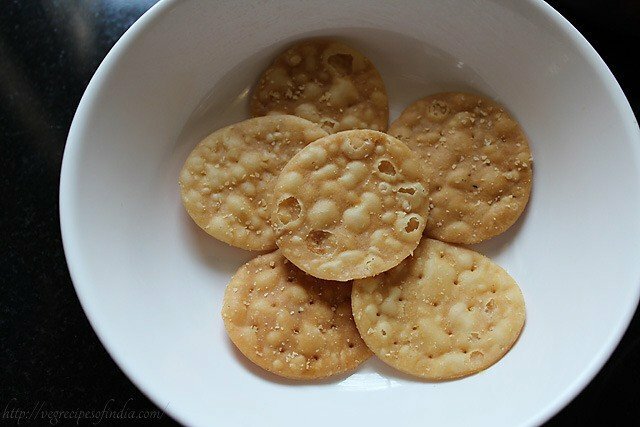 you can check this papdi recipe to make fried as well as baked papdis at home. 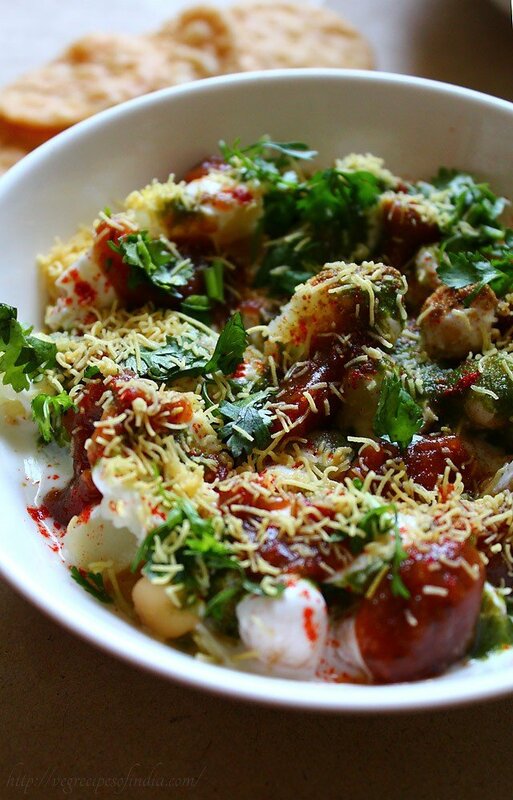 also some moong sprouts and pomegranate can also be added to the chaat. if you wanna add chickpeas to the papdi chaat, then some effort is needed. this is if you don't want to use canned chickpeas. you need to soak the chickpeas in enough water overnight or for a good 6-7 hours. then cook or pressure cook the chickpeas with water and salt/black salt till it is completely cooked. blend all the ingredients with very little water to a smooth paste. boil the tamarind and dates in water. when they become soft add the jaggery and the spice powders and salt. cook further till the jaggery melts. grind the chutney mixture to a smooth paste. seive the chutney through a strainer. add more salt if needed. if the chutney becomes too thick add some water to liquidize it. arrange the papdis in a shallow bowl or plate. top it up with chopped boiled potatoes and cooked chickpeas. you can add chopped onions and tomatoes to it, but its optional. sprinkle some chaat masala and red chili powder on it, if you want at this stage. 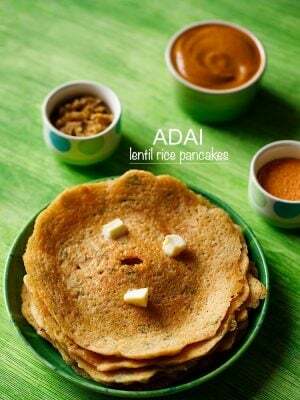 top these with cold yogurt/curd as much as you want. top it up with the green chutney as much as you want. and then with the sweet chutney as much as you want. sprinkle some chaat masala, red chili powder, cumin powder and black salt. 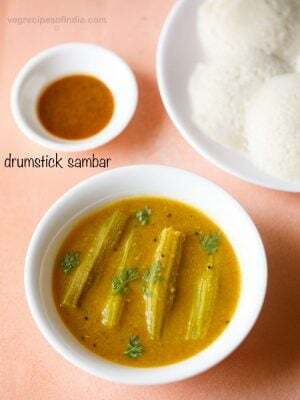 garnish with coriander leaves. sprinkle sev on top and this step is also optional. add a dash of lemon juice to the papdi chaat if you want. 1. arrange the papdis in a shallow bowl or plate. 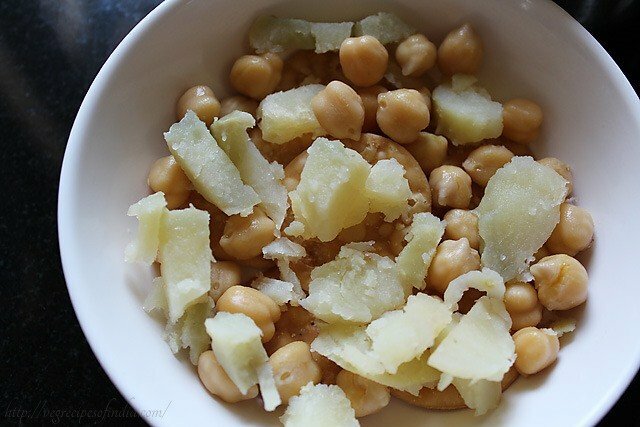 2. top the papdis with boiled potatoes and boiled chickpeas. 3. add a generous amount of fresh beaten curd. 4. add the green mint coriander chutney as much as you want. 5. top up with the sweet tamarind dates chutney. 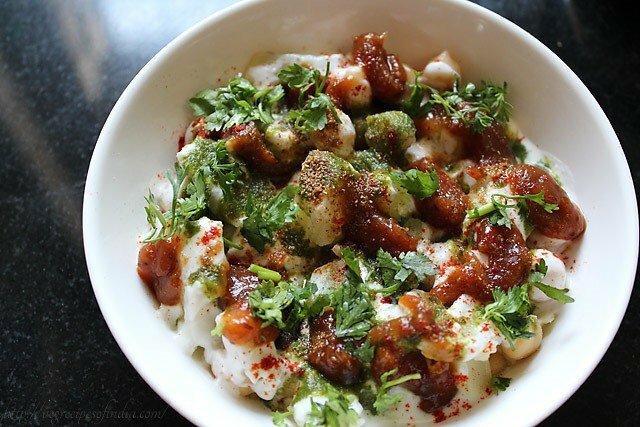 6. sprinkle all the spice powder and garnish papdi chaat with chopped coriander leaves. at this point i wished i had fresh pomegranate to add to the papdi chaat. it would have added a lovely color and texture to the recipe. 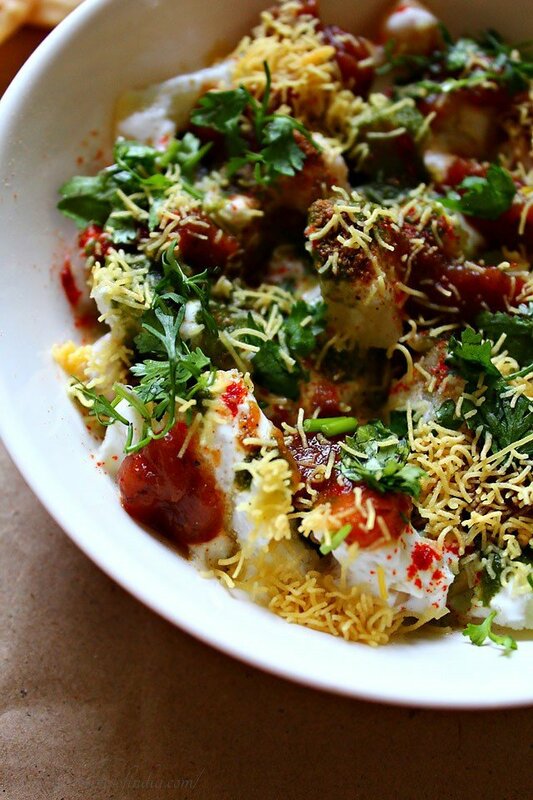 8. serve the papdi chaat immediately as soon as you are done preparing it. 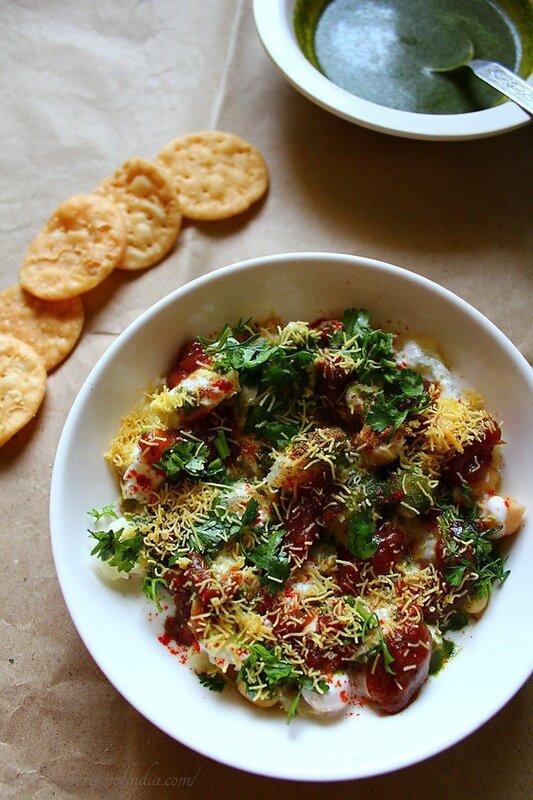 adding onions or tomatoes to papdi chaat is optional. 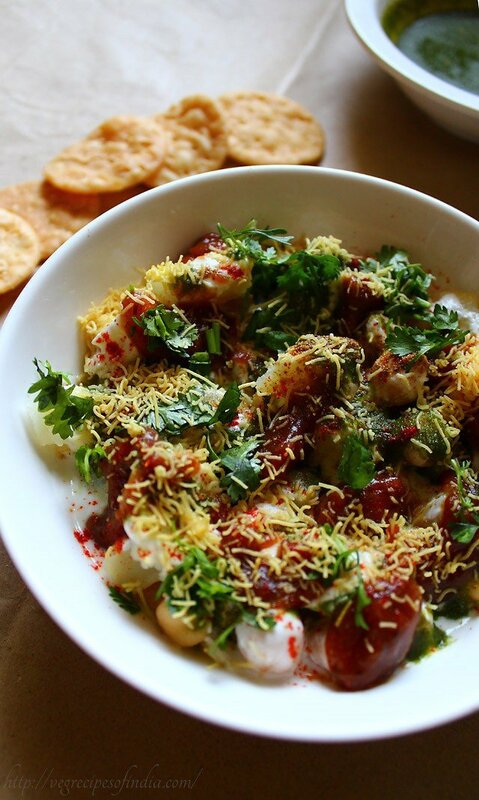 onions add a nice crunch to the papdi chaat. i made one serving with onions and tomatoes and this was also too good. Lovely recipe and looks so tempting! I am planning to make this on the weekend for a party of 30. Do u think i should just get all the raw material ready and have the guests assemble their own plates? I am worried that if i assemble everything then it may get soggy. Any ideas and tips will be highly appreciated. its a better idea to let the guests assemble. 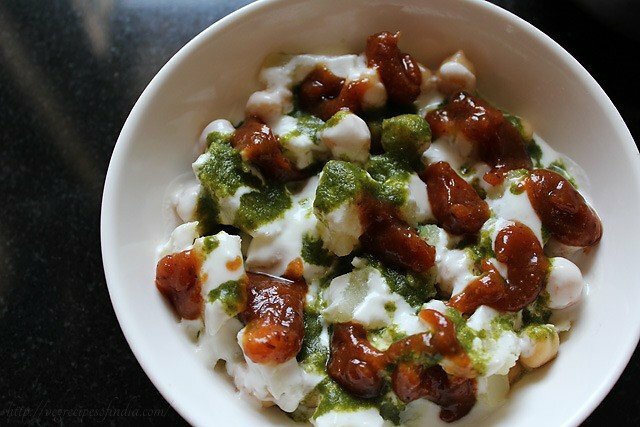 if you assemble and serve papdi chaat it will get soggy. just keep everything in bowls in the order in which the papdi chaat is assembled. all the spice powders+salt can be mixed together and served in one bowl. 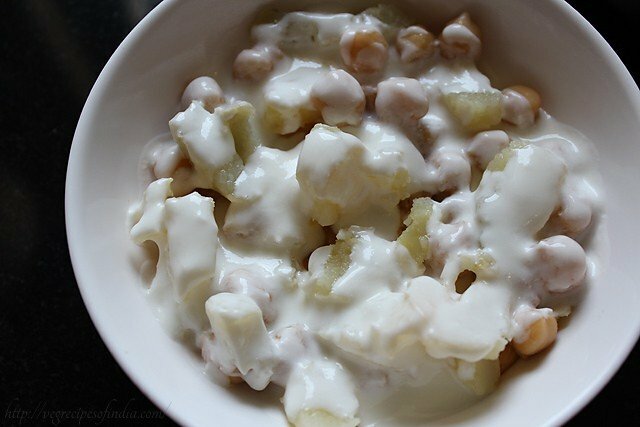 you can also mix the curd+cooked chana+boiled potatoes in one bowl. All receipe are nice and easy to understand.